If you've got kids or pets, you know that keeping your carpet clean is a constant challenge. You want carpet for all its benefits - it's affordable, comfortable, and looks great. The challenge is keeping it looking great after it's been lived with for a while. When busy families stop by our Indianapolis flooring store, one of our top recommendations are carpets that take advantage of the strongest stain and wear protection available. Carpets like Stainmaster Active Family carpet or SmartStrand from Mohawk. 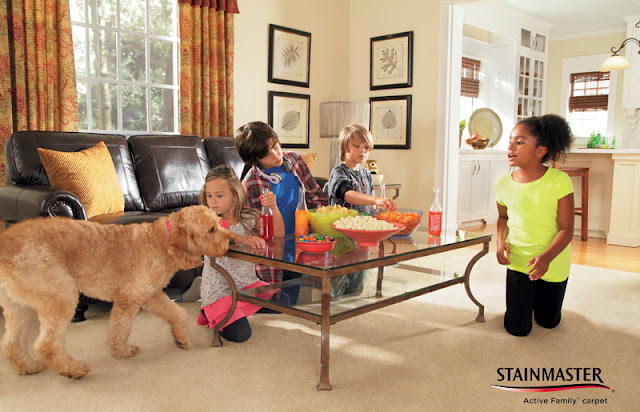 Manufactured with high-quality materials and built to demanding performance specifications, STAINMASTER® Active Family® carpet is perfect for the family who wants nice carpet that is durable enough to handle an active lifestyle. Kermans is proud to be an Indianapolis Stainmaster carpet dealer. Learn more about Stainmaster, including their PetProtect carpet option. SmartStrand Forever Clean is the only carpet that lets you have it all—unbeatable spill protection, permanent stain resistance, long-lasting durability, and so much more. Kermans is proud to be an Indianapolis SmartStrand dealer. Learn more about Mohawk's SmartStrand carpet protection. Kermans Flooring has been Indianapolis' top carpet store for decades because we understand what families need when it comes to flooring. Ready to shop for carpet for your busy Indianapolis home? Make an appointment with one of our design consultants - their services are free - and they'll have some Stainmaster or SmartStrand options laid out and ready to review.